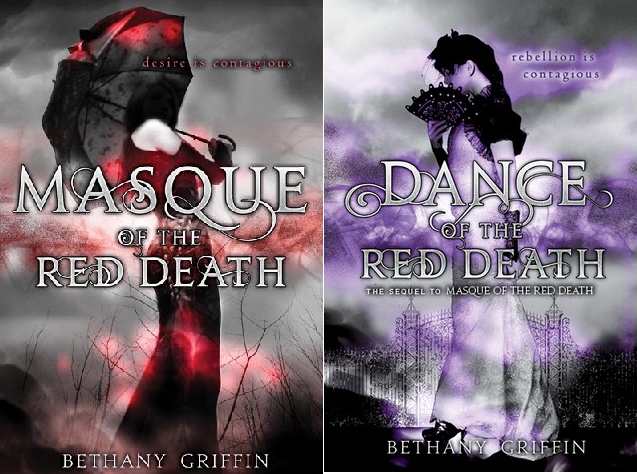 this week I’m reading Masque of the Red Death, and its sequel Dance of the Red Death, by Bethany Griffin (Published in April 2012 and June 2013 by Greenwillow Book). I won both those books in a giveaway hosted by Hannah at Once Upon A Time. These books were inspired by a short story written by Edgar Allan Poe in 1842 and entitled “The Masque of the Red Death”. In this retelling, the story takes place in steampunk/post-apocalyptic world. It has a very gothic atmosphere, an interesting heroine and a compelling plot. I’m loving it! But in the depths of the club—in the depths of her own despair—Araby will find more than oblivion. She will find Will, the terribly handsome proprietor of the club, and Elliott, the wickedly smart aristocrat. Neither is what he seems. Both have secrets. Everyone does. And Araby may find not just something to live for, but something to fight for—no matter what it costs her. Have you read Masque of the Red Death? What did you think? And what are you reading this week? Feel free to leave me a comment below! This entry was posted in Book of the week and tagged Bethany Griffin, Book of the Week, Dance of the Red Death, dystopian novel, EM Castellan, gothic, Masque of the Red Death, steampunk, YA Books, Young Adult literature. Eep! I’m excited to hear that you’re loving it. I’ve had it on my Nook for awhile but haven’t gotten to it yet.